Specialty: Produces Micro-engineering, Laser & Photonic Equipment for the Semiconductor, Electronic Interconnect, Passive component manufacturing Industry. Oldest high-tech company in Oregon. Electro Scientific Industries, Inc. (ESI) designs and builds advanced production equipment used worldwide in the electronics & Semiconductor manufacturing industries. 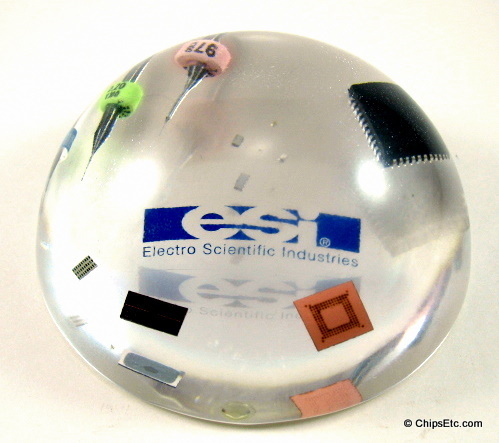 This Lucite Dome-Shaped Paperweight contains numerous manufacturing and finished components from ESI. Items embedded inside include examples of BGA & DIP Integrated Circuit packages, individual chip die and micro machining bits.